Miss Saigon is the longest running musical at the Theatre Royal Drury Lane, beating the previous record holder My Fair Lady in December 1994. 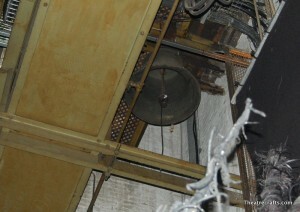 There remains a bell, hanging in the upstage left wing, which was used in Miss Saigon. It’s still rung during the last curtain call of a show on its closing night. 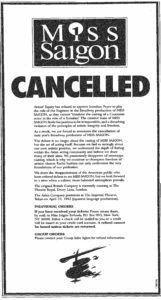 New York: The Broadway production was threated with cancellation in 1990, despite huge advance sales. Jonathan Pryce (a caucasian man) originated the role of The Engineer in the London production, but the American Actors’ Equity Association refused to allow him to potray the role of the Eurasian pimp in America. 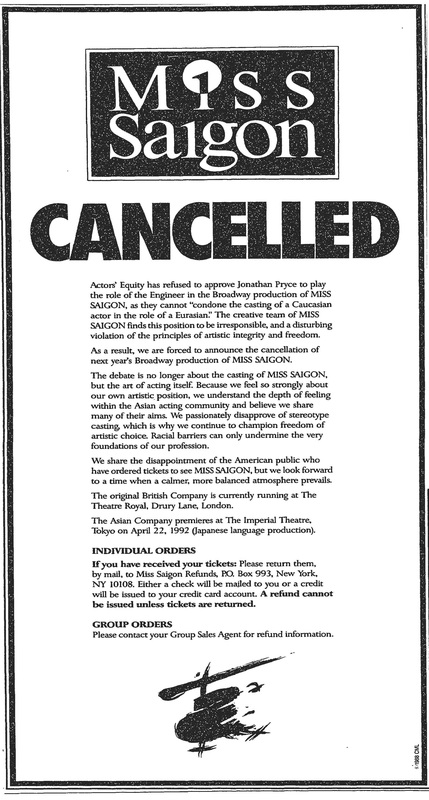 This led to criticism from many, and Cameron Mackintosh, the Producer, threatened to cancel the show (see advert right). AEA was eventually forced to overturn its’ decision on the basis that Jonathan Pryce was being discriminated against (as a white man he wasn’t being allowed to perform the French-Vietnamese role), and also as he had ‘star status’, the role didn’t require an American casting call. Broadway: Broadway Theatre (11 April 1991 – 28 January 2001) after 4092 performances.